I love Easter time. All of the different bright colors, everything in bloom. There is no better day then to host a get together after Sunday morning worship sevice. We decided on having a cookout that included an egg hunt. 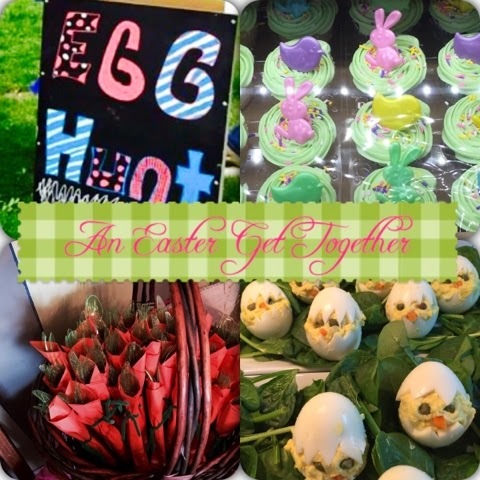 Did you know that it is very hetic to host a party right after morning worship service? You basically have to have all the decorations in place and all the food ready to go before you leave your house that morning. Here is some of my favorite decorations from the get together. 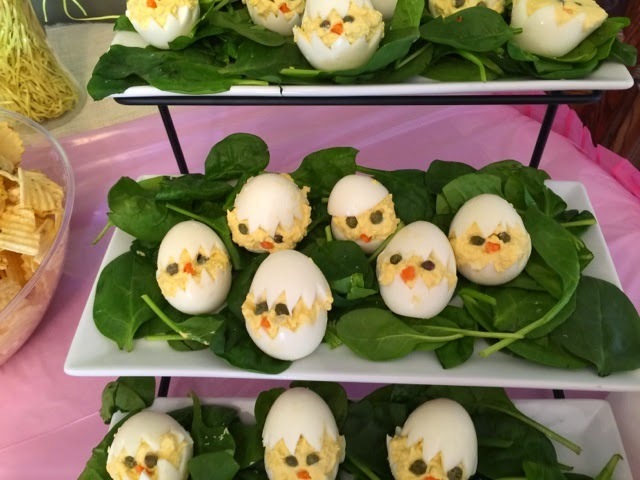 They are simple but it brought that Easter feel to the table. Sometimes simple is the best way to go. 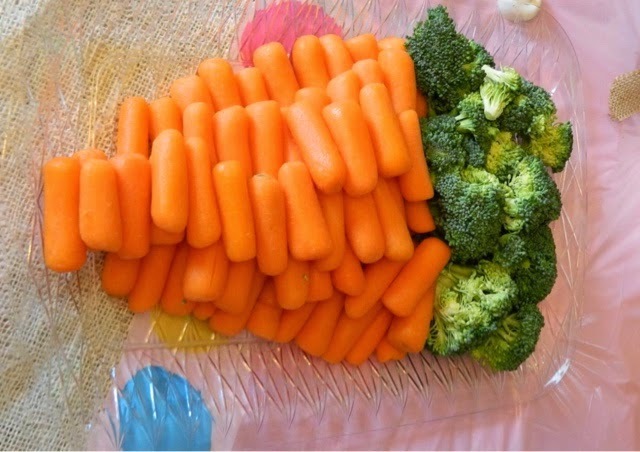 These are so simple to do. Just buy orange napkins, green plasticware, and green pipe cleaners. Roll them up and tie with a pipe cleaner. Yes, it is that simple. 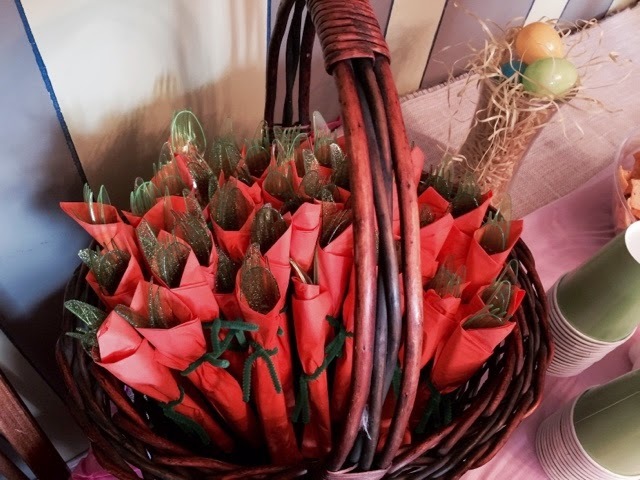 Then you just place them in a cute dark brown basket. I picked up this cute banner at Target. 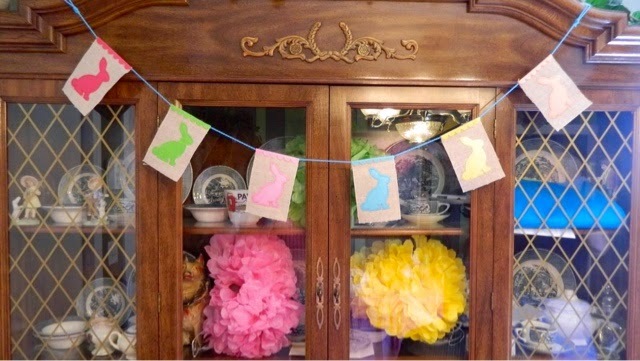 To make it more colorful I threw in some party poms in the hutch. 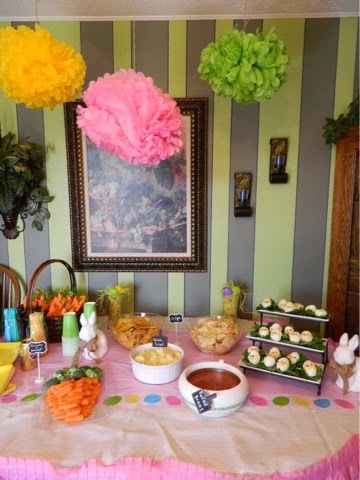 I also hung three of those cute party poms over the food table. I prayed that one would not fall into the food. They survived through the entire party. The great thing about these party poms is that they are reusable, if you have a place to store them. These cute ones hanging up, are working their second party. The food was simple hotdogs, chili, hambugers, chips, potato salad, and baked beans. Here is the view of the food table. The hamburgers, chili, and dogs were on the counter. Check out the bunnies I picked up at Target, aren't they cute? The dessert table was not fancy. 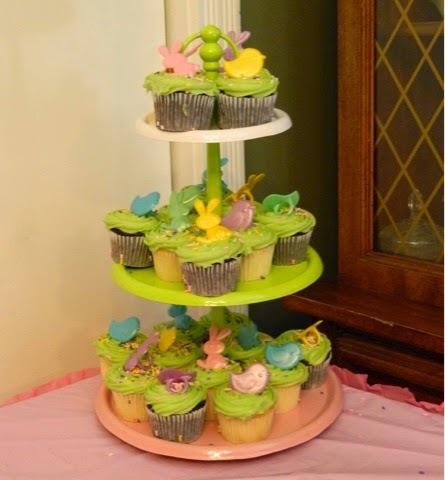 I did buy some cute cupcakes and placed them on a stand, with the rest of the desserts that the guests brought. I tried to make some Jello eggs and that turned out to be a big mess. I will have to share with you, later about my Pinterest Jello flop. Outside there was simple decorations also. I loved the sign that was at the stairs of the deck. 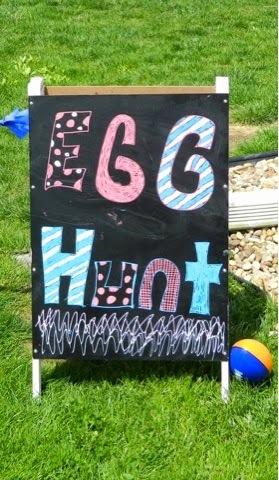 I made this cute chalk board sign that was used as the start line for the egg hunt. I tied blue streamer paper around it and a big flower pot at the other end and had the kids run thru it. Over all the party was a big hit! We had a blessed Easter. I hope your day was blessed also. Always remember the true reason for Easter.